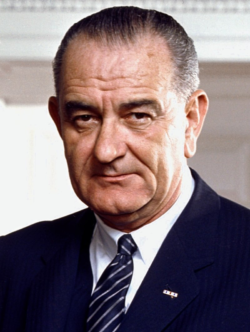 As president, Lyndon B. Johnson oversaw numerous key actions that affected immigration to the U.S., the most important of which was the 1965 Immigration and Nationality Act, which eliminated a longstanding quota system in favor of preferences that favored family reunification and the migration of skilled workers. The 1965 Act, which was an outgrowth of polices John F. Kennedy was working to enact when he was assassinated in 1963, shaped immigration policy for decades and helped lead to a significant increase in the number and regions of origin of immigrants in the U.S. In 1964 Johnson presided over the Congressionally-mandated end of the Bracero program, which had brought workers from Mexico to help with agricultural harvests since 1942. While president, Johnson also oversaw an organized airlift of Cubans migrating to the U.S. to escape the Communist government of Fidel Castro. The program ran until 1973 and brought more than 250,000 Cuban refugees to the U.S. The 1966 Cuban Adjustment Act allowed these refugees to become lawful permanent residents after spending two years in the U.S.
On Nov. 1, 1968 the U.S. government signed the U.N. High Commissioner for Refugees Protocol, which amended a 1951 U.N. convention on refugees to remove “geographical and temporal limits” which had hampered its universal application.